TUSCALOOSA, Ala. — The University of Alabama’s Black History Month celebration includes innovative and informative events. 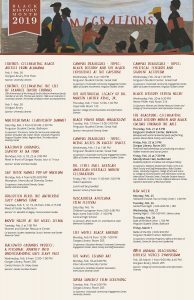 UA Crossroads coordinates the activities each year; for more information, go to https://crossroads.ua.edu/black-history-month/. Included in the activities is University Libraries’ exhibit “Celebrating the Life of Frankie Taylor Thomas; The University of Alabama’s First African-American Faculty Member.” This year is the 50th anniversary of the 1969 hiring of Thomas as an instructor in University Libraries. The exhibit will feature other accomplishments and will be up throughout February on the first floor of Gorgas Library. Hallowed Grounds: Slavery at UA Tour: 3 p.m. Mondays, Feb. 18 and 25. Meet in front of Gorgas House historic marker. The tour is one hour. Sponsor: Gender and race studies. Say Their Names Pop-Up Museum: The exhibit is at the Intercultural Diversity Center. Co-sponsors: Intercultural Diversity Center and gender and race studies. Forgotten Hero: The Autherine Lucy Campus Tour: 2 to 3:15 p.m. Tuesdays, Feb. 12, 19 and 26. Co-sponsors: Dr. Meredith M. Bagley and the department of communication studies. Hallowed Grounds Project: A Personal Journey into Understanding UA’s Slave Past: Noon Wednesday, Feb. 6, 205 Gorgas Library. Sponsor: gender and race studies. Contact: Dr. Hilary N. Green, associate professor of history and gender and race studies, hngreen1@ua.edu. Campus Dialogues: “Black History and the Black Experience at the Capstone.” 1 p.m. Wednesday, Feb. 6, Ferguson Center Great Hall. Co-sponsors: Crossroads Community Engagement Center, Office of Student Involvement, Ferguson Student Center. The Rhetorical Legacy of Dr. Martin Luther King Jr.: 12:30 p.m. Thursday, Feb. 7, Lloyd Hall Room 133. Sponsor: College of Communication and Information Sciences. Black Power Hour: #Blacklove: Noon-2 p.m. Tuesday, Feb. 12, Ferguson Center Great Hall. Sponsor: Intercultural Diversity Center. Campus Dialogues ; “Being Allies in Racist Spaces”: 1 p.m. Wednesday, Feb. 13, Ferguson Center Great Hall. Co-sponsors: Crossroads Community Engagement Center, Office of Student Involvement, Ferguson Student Center. Dr. Ethel Hall African American Heritage Month Celebration: 11 a.m. Friday, Feb. 15, Hotel Capstone. Sponsor: School of Social Work. Tuscaloosa Africana Film Festival: Saturday, Feb. 16, Central High School. The children’s screenings will be from 2 to 5 p.m., and the main screenings will be from 6 to 11 p.m. The main screenings will include the Alabama-based and Oscar-nominated documentary, “Hale County This Morning, This Evening.” Admission is $10; free for UA students with an ID. Co-sponsors: Afram South, Inc. and Edward A Ulzen Memorial Foundation. Life While Black Abroad: Noon to 1 p.m. Monday, Feb. 18, Gorgas Library 205. Sponsors: Education Abroad, Crossroads Community Engagement Center, Black Faculty and Staff Association. The Wave: Island Art: 6 p.m. Monday, Feb. 18, Intercultural Diversity Center. Co-Sponsors: Caribbean Students’ Association, Intercultural Diversity Center. “Sonia Sanchez” Documentary Screening: 5 p.m. Tuesday, Feb. 19, Gorgas Library 205. Co-Sponsors: Crossroads Community Engagement Center, University Libraries. Campus Dialogues: “Political Tension and Student Activism”: 1 p.m. Wednesday, Feb. 20, Ferguson Center Great Hall. Co-sponsors: Crossroads Community Engagement Center, Office of Student Involvement, Ferguson Student Center. Black History Trivia Night: 6:30 p.m. Wednesday, Feb. 20, Reese Phifer Hall Room 216. Co-sponsors: Women and Gender Resource Center and College of Communication and Information Sciences. The Blackout: Celebrating Black History Month and Black culture through the arts. Feb. 21: 6 p.m., Ferguson Ballroom: Banquet with world-renowned poets performing poems about Black history and culture. Feb. 22: 2 p.m., Gorgas Library 205: Poets will lead workshops on producing art about hidden histories and social justice. Feb. 22: 7:30 p.m., Moody Auditorium: Students performing art about UA campus history. Co-sponsors: Alabama Students for Poetry, D.R.E.A.M., Black Faculty and Staff Ambassadors, Black Student Union, University Programs, College of Arts and Sciences, College of Communication and Information Sciences, Intercultural Diversity Center, Graduate Student Association, Alabama Forensic Council, Safezone Resource Center, Capstone Association of Black Journalists. 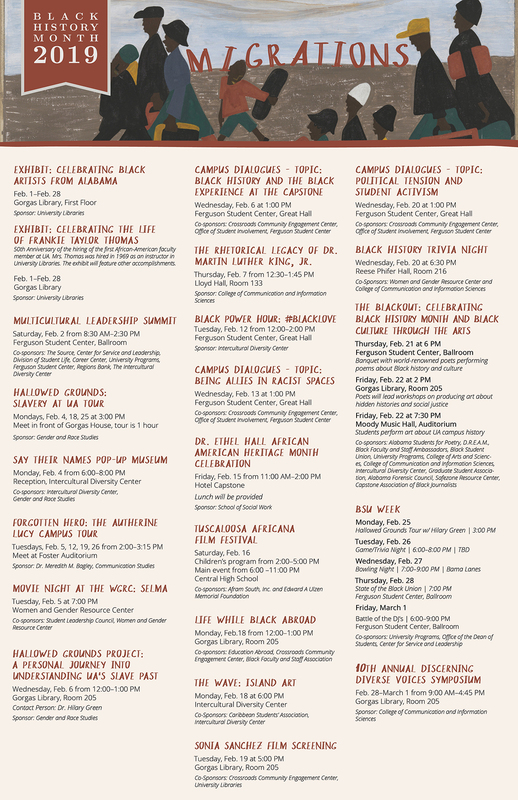 Black Student Union Week: Feb. 25 – March 1. 3 p.m. Monday, Feb. 25: Hallowed Grounds Tour with Dr. Hilary N. Green. Meet in front of Gorgas House historic marker. 6 to 8 p.m. Tuesday, Feb. 26: Game/Trivia Night. Location is TBA. 7-9 p.m. Wednesday, Feb. 27: Bowling Night, Bama Lanes. 7 p.m. Thursday, Feb. 28: State of the Black Union: Ferguson Center Ballroom. 6 to 9 p.m. Friday, March 1: Battle of the DJs, Ferguson Ballroom. Co-sponsors: University Programs, Office of the Dean of Students, Center for Service and Leadership. 10th Annual Discerning Diverse Voices Symposium: 9 a.m. to 4:45 p.m. Feb. 28-March 1, Gorgas Library Room 205. Sponsor: College of Communication and Information Sciences. Details. TBA.